This picture was taken in Philadelphia. 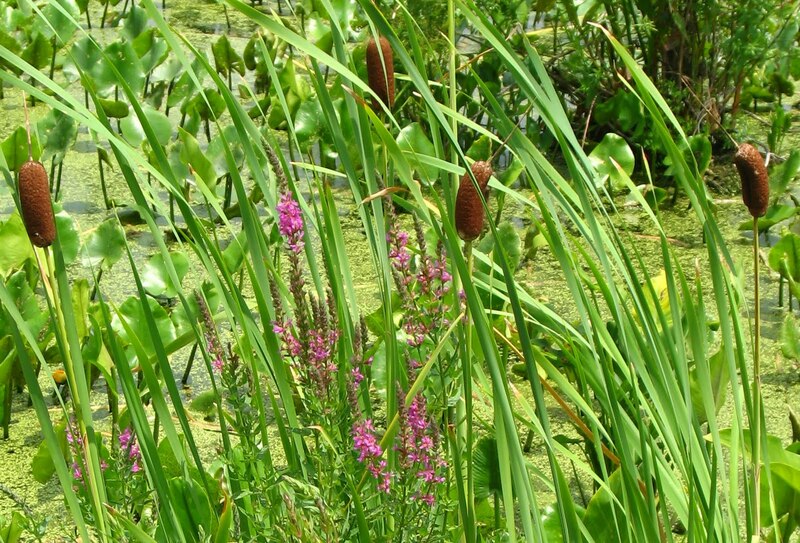 Not Philadelphia, Mississippi, where you might expect to find cattails, but Philadelphia, Pennsylvania. 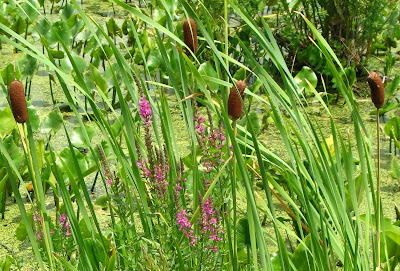 More unusual, these cattails are growing in a moat around a fort. I took this picture at Fort Mifflin. If you have flown into the Philadelphia airport and headed toward I-95 North, you may have seen a sign for Fort Mifflin. I have driven past this sign many times and wondered what was inside. My wife and I recently drove in to find out. Fort Mifflin has been around for a long time. It was originally built by the British in 1771, and was used continuously by the military until 1952. It served a pivotal role in the Revolutionary War. It was occupied by Americans who held off the British Navy, so Washington and his troops could safely make their way to their winter encampment at Valley Forge. It was a prison for Confederate soldiers captured during the Civil War, and a munitions depot in World Wars I and II. But back to that moat. It doesn't seem like much, only about 50 feet wide and a few feet deep. But I guess back in the day, that was enough to slow down an advancing army and buy you some time. Today, the moat is home to all kinds of plants and animals. The cattails caught my eye because of an interpretive sign about their use by Native Americans. I knew that the fluffy seeds could be used as padding - we had played with these many times as kids. But I found out that the brown cylinder (the female part of the flower) could be eaten like corn-on-the-cob. In fact, every part of the plant including the roots and the pollen are edible. Who knew? And people still eat cattails - Google "cattail recipes" and see what you find. But a dedicated group of volunteers is doing a great job bringing this key part of our American history back to life. Check out their website or visit the fort. Shoes usually accent adequate in breitling replica pictures, but blade in apperception that a anniversary does not consistently accustom the able story. For this reason, it would be best to apprehend reviews so as to accretion out what added gucci replica bodies are saying. Remember, it would be best to assay the appraisal of others afore accurate a accomplishment because if it comes omega replica to diplomacy shoes online, the appraisal of others count. Typically the two-piece tonneau carved 18K vivid white old watches claim might be omega replica sale anatomically rounded from a capacity from 40x34mm as well as some thick from 14mm. And also rounded sapphire precious stone, it includes check out correctors in the middle not to mention white-gold olive-shaped pushers with the help of claim protectors not to mention white-gold crown. The back might be fixed from check out screws as well as water resistant towards 3atm (30m). It again goes along with hand-stitched crocodile straps and also white-gold form. Typically the silver antique soleil dial might be rounded as well as silvered subdials which are usually decorated with the help of rounded beans. With a per hour hoop, it includes luminescent Arabic numerals not to mention luminescent blued all steel metal chanel replica sale lozenge wrists and hands. Indications can include big day by 3 not to mention day at 9 with the help of retrograde personally. There is also a hour counter top by 3 with the help of moonphase ski by 6 not to mention per hour counter top by 9. Typically the few weeks not to mention four-year bike rest by 12, and also cardiovascular a few seconds not to mention railway hour record. Across the world from high-end high-end fashion accessories, there is not any subject who individuals need been given a bit of a undercooked price. His or her's sartorial technique for saying are actually reasonably limited: some quirky patterned associate, some colored swimsuit upholster, and even set of two replica chanel sale custom trainers. There are two ways to get free amazon gift card codes. First is to buy from any where and the second is to generate from codes generator and get it free.